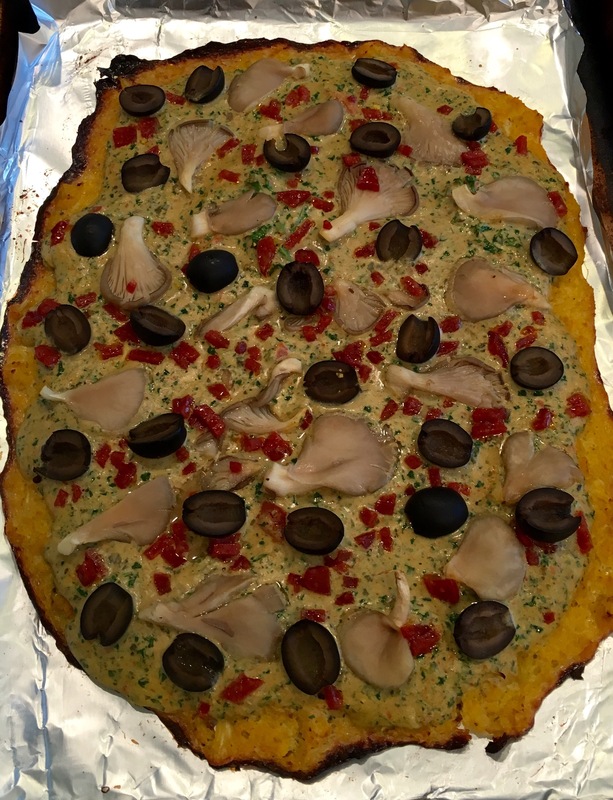 Cauliflower “pizza crust” – Eat, Drink, and Go! Ok Facebook, usually I just watch the video of speed-making food and move on, but I had to actually try out the cauliflower pizza crust. Why? Because I love pizza, I love cauliflower, but I try to stay low carb. Plus, in the spirit of Passover right now, it was a viable dish for the observant. So I figured this experiment had to happen. While it looked like things were going well, it even sliced ok, it was not pickup-able like a pizza. Grate the cauliflower into a microwave-safe bowl, then steam for 3 min, then mix in an egg and some salt. Bake at 400 forever (it did not crisp in the middle for me like it did on FB). I topped it with a pesto parmesan cream sauce I made cause I was out of tomato products (don’t worry, I went grocery shopping the next date to remedy this tragedy). Then I placed some oyster mushrooms, diced pepperoni, and black olives on top. Final touch of mozzarella to get the top melty. Maybe I’ll try this again with some tweaking to get it crustier. Tweaking usually works for most things. Plus tweaking is fun to say cause you have to make a “tweak” gesture when you say it! !